I have a lava-lamp, which should not be on for more than 5 or 6 hours at a time. So I decided to move it from switching on/off manually to something a bit more automated. 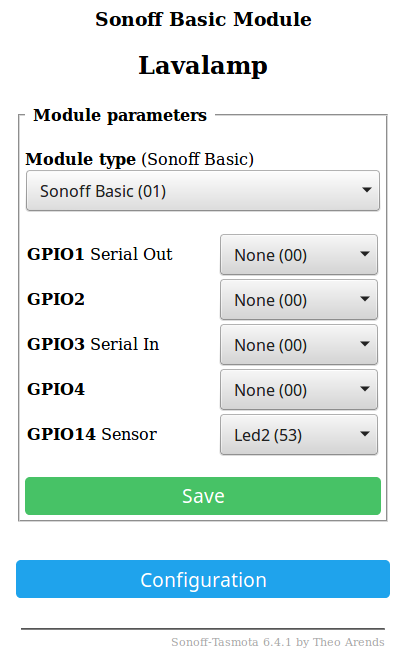 For this I reprogrammed a Sonoff WiFi switch (based on the ESP8266). Now it can be controlled via voice commands (via Alexa / Amazon’s Echo Dot), and via some simple CURL (Wifi) command line call’s. The curl’s are put in a cron (timer) process on my linux server, and turn the lamp on and off at certain times. The Alexa voice override is added for occasions when you want to deviate from the scheduled times. The plan is to add a little software service, which monitors the duration the lamp is on, and if it reaches 5 hours, it should automatically switch the lamp off again. When leaving a lava-lamp on for too long, it’s fluid might become cloudy. The (very nice!) 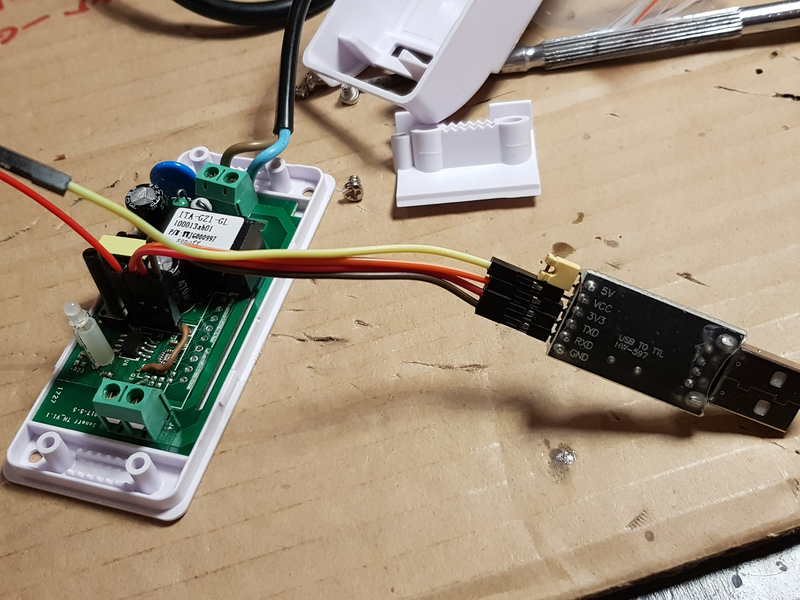 firmware I used came from this project: https://github.com/arendst/Sonoff-Tasmota, and can be flashed using a USB to serial converter, and soldering in some program header pins in the Sonoff. In addition to soldering in the programming header pins, I also added a piece of wire to connect the unused red color from the two color led in the device. 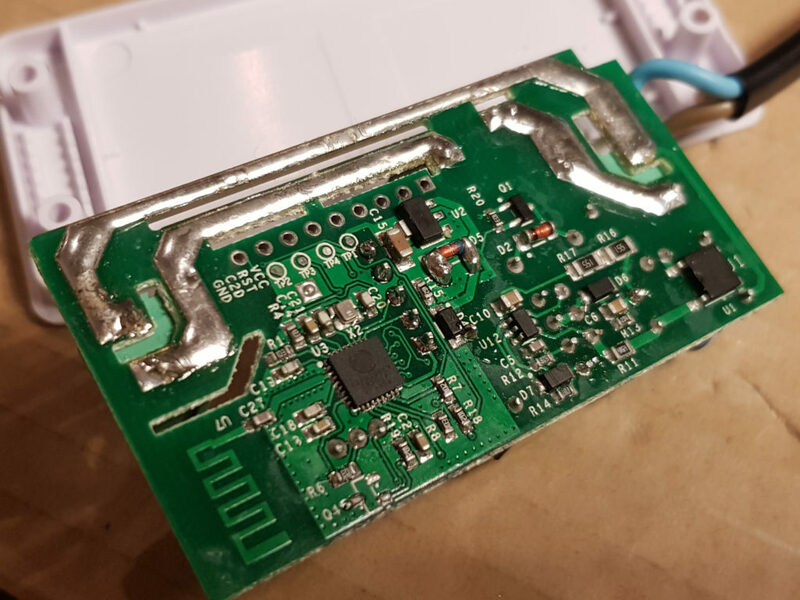 The Sonoff comes with a dual color led, because another version of the device (using the same printed circuit board, which has 433Mhz remote in addition to WiFi) uses the second color also. 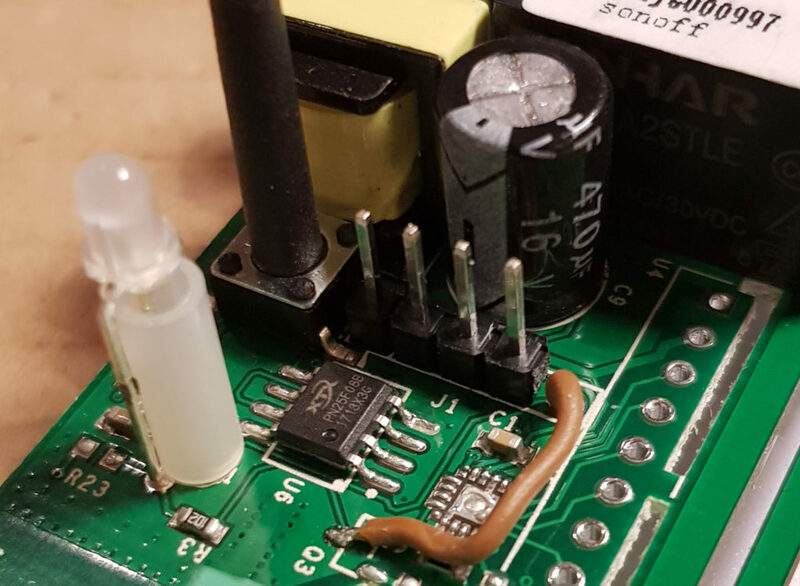 WARNING: DO NOT CONNECT MAINS POWER AT THE SAME TIME AS THE PROGRAMMER! 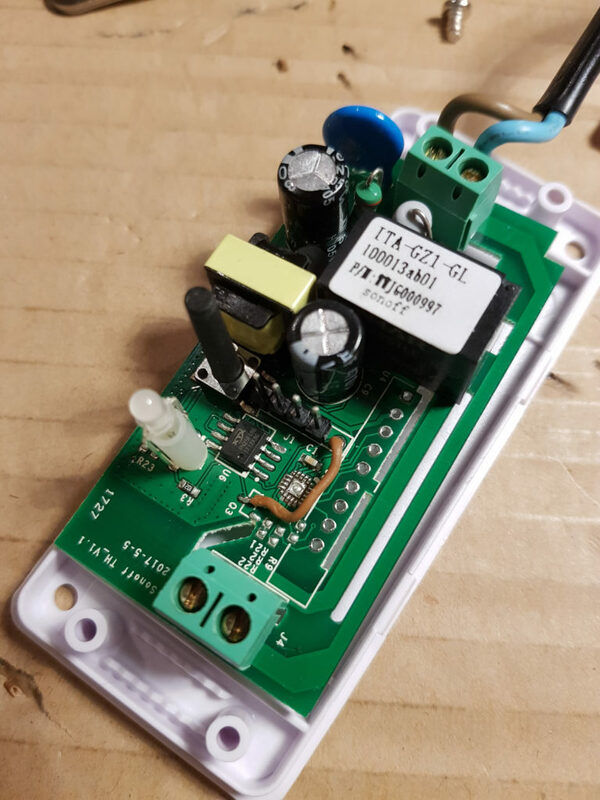 Even better; do NOT connect mains power when the Sonoff is unboxed… The circuit has NO separation from the mains power lines! Deadly for human’s and for programmer/computer. Pin 1 counting from closest to the led. The extra red led wire runs from pin 5 to a solder spot marked with Q3. WARNING: do NOT connect the mains power when programming! To get my Sonoff detected by my Amazon Echo Dot (Alexa), I had to use the “Hue Bridge” simulation. 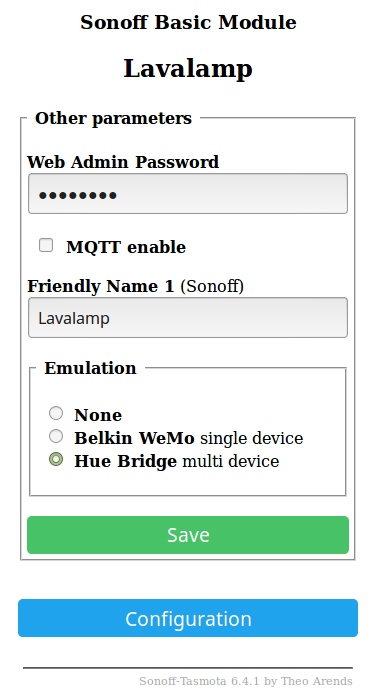 The “Belkin WeMo” simulation did not work, due to a bug in the ESP libraries (not in Tasmota). Probably get’s fixed in due time. Note: I did give my Sonoff a static IP number in the DHCP configuration of my router, just to make sure that my curl commands will always work with the same IP. 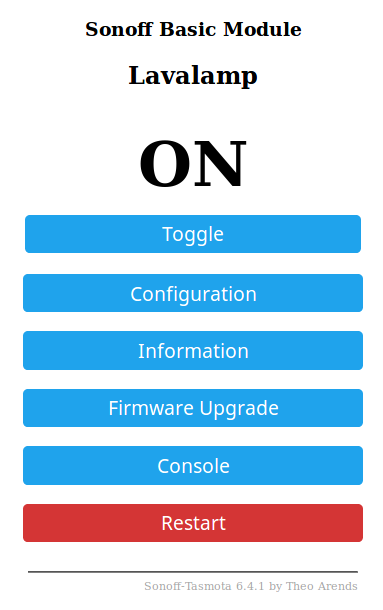 Note: I did use an “old” ESP8266 version of the Sonoff. Nowadays, there’s a new version in the wild; it has non-replaceable memory (1 MB is built in, in the new ESP8285), and it does not have the extra pin for connecting to the red led. But… you can still solder on the 4 pin header, and reflash it using Tasmota firmware. No worries – lots of info online to be found.